We have cruised with Princess. Royal Caribbean, Cunard and P&O but have never tried Norwegian. So this 2 day repositioning cruise on Norwegian Jade from Southampton to Hamburg seemed like the perfect opportunity. The ship was due to leave at 8pm so we both worked in the morning and got the train down from London Waterloo to Southampton Central. After a quick cab ride to the terminal we arrived around 2:15pm, dropped off our suitcase with the luggage handlers and were on the ship within 10 minutes! 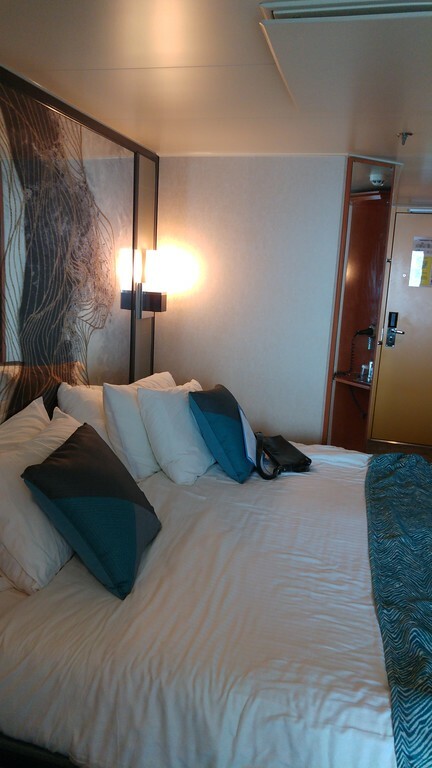 We headed straight to our balcony cabin on aft deck 10. The hallway was very different to the other cruise lines with bright orange louvre doors and blue direction-indicating fishes carpet. The cabin itself was a good size with a comfortable bed and separate sofa. It only had a bedside table on the side of the queen bed near the wall which was inconvenient. The cherry wood doors in the cabin made it feel a little dated – heck, there was even an ashtray fixed to the wall in the toilet! 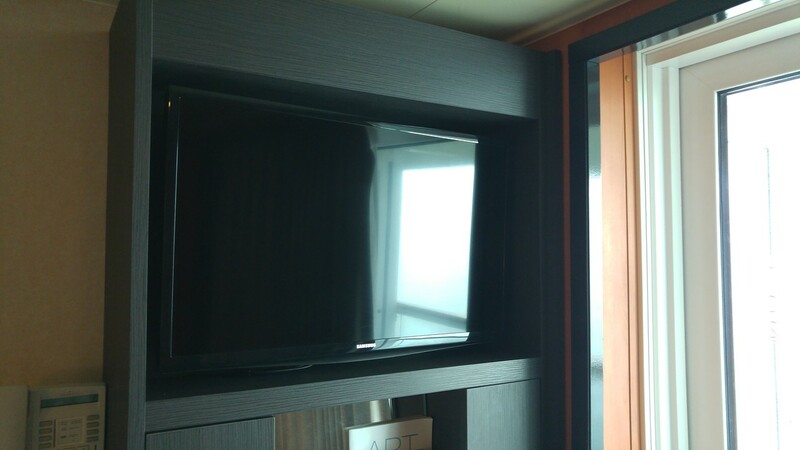 But there was a modern flat-screen TV and USB ports installed more recently. The mini-fridge was locked which was annoying as we wanted to keep bottled water in it that we had purchased on the ship. We never saw the room steward at all over the 2 day cruise to ask about it. The balcony was a decent size with two chairs and a table. The bathroom had three separate areas – shower, basin and toilet. The shower was fantastic – roomy, powerful with a removable shower head. 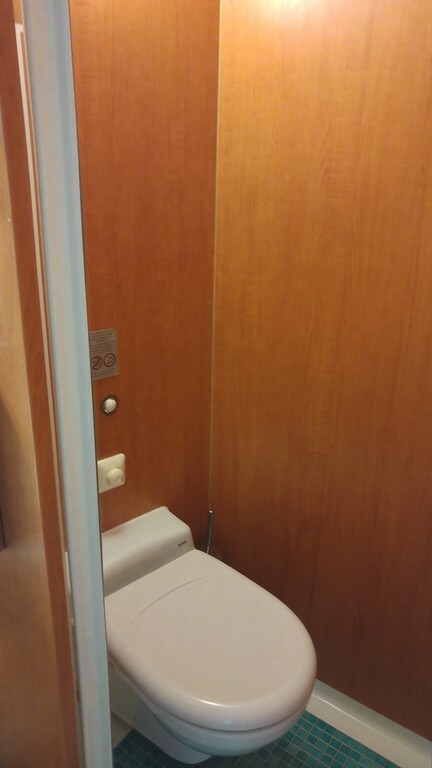 However, the basin and toilet were very tight on space and this layout would be a deal-breaker for us on a longer cruise. After dropping off our rucksacks and putting our valuables in the safe, we headed up to the Garden Café buffet. This was very busy as usual on embarkation day but we managed to find a spare table before taking it in turns to wander around the serving stations looking for light bites to eat. There were plenty of options and even a self-serve ice-cream dispenser! I noticed there was a different approach on drinks where you had to obtain these from a separate station rather than asking the wait-staff. We then headed out onto the pool deck and ordered our first beer and cocktail. The drinks were ice cold and the cocktail glass, although small and plastic, had the right level of alcohol. Back to the cabin and our suitcase had arrived so we unpacked a little before trying to book a speciality dining slot. The lady on the reservations line said they would need to check availability and phone us back. We waited 15 minutes before calling again and spoke to another lady who said the restaurant in question was fully booked. Not happy! So we gave up – you are able to book restaurants online beforehand but we didn’t know when the muster drill would be held on the first night. We headed down to the Atrium to get our bearings. We weren’t totally clear where our muster station was so we went to Guest Services and found a ship map to carry around. Knowing we didn’t need to take our lifejackets with us (how refreshing! ), we headed off early to the Grand Pacific Dining Room for a pretty painless drill. Dinner at O’Sheehans was delicious. We went for a main and dessert, but boy, the desserts were so flavoursome! When it was advertised as an Irish bar. I had expected the seating to be more pub-like and comfortable but this was a little more upmarket. Great views of the sea or atrium though and the staff were very attentive. The rest of the first evening was spent playing trivia, drinking cocktails and attending the Liquor Tasting event at the Tradewinds shop. The latter was well attended but a bit disappointing as there were only 3 different liqueurs on offer. We found some comfy sofas opposite the Mixers Martini and Cocktail bar on desk 6 and listened to the talented piano player. We noticed this area was often invaded by wafts of hot food smells (probably from the restaurants a deck up) which wasn’t always pleasant. We had a comfortable night’s sleep and the next day headed up to the buffet for breakfast. There was a good selection including fresh toast and fried eggs made to order by the staff at the omelette station. 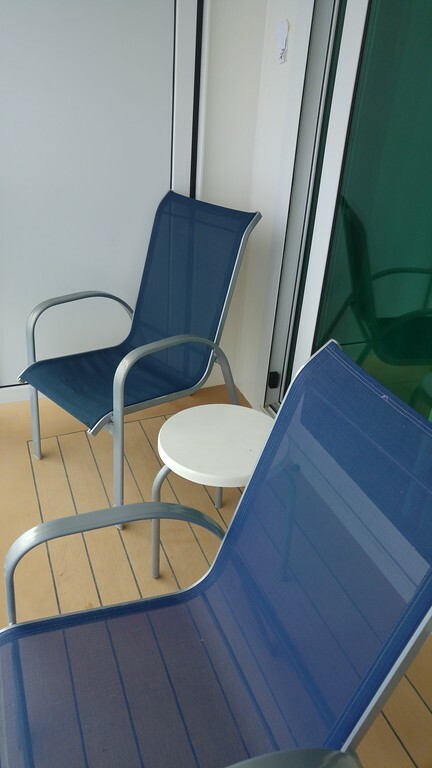 After breakfast we headed off to explore other areas of the ship like the Sun decks, the oh-so-walkable Promenade deck, the gorgeous Spinnaker Lounge on deck 13 forward and the Bliss Lounge with funky seating on deck 8. Also treated ourselves to a late morning hot chocolate and coffee in the Atrium. There was a wide range of entertainment provided throughout the day and we attended multiple trivia games, a musical game show, and watched live music and karaoke in the evening. Some of the trivia questions were based on US culture which created confusion for the large number of UK cruisers. 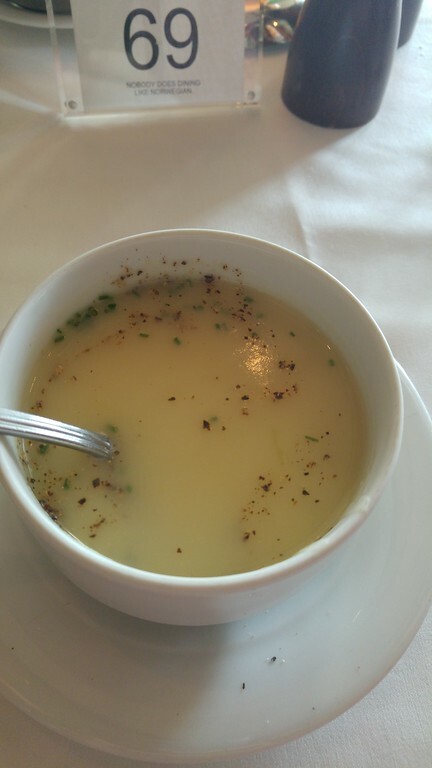 We ate again at O’Sheehans for lunch and then had a full course meal in the Grand Pacific Dining Room for dinner. 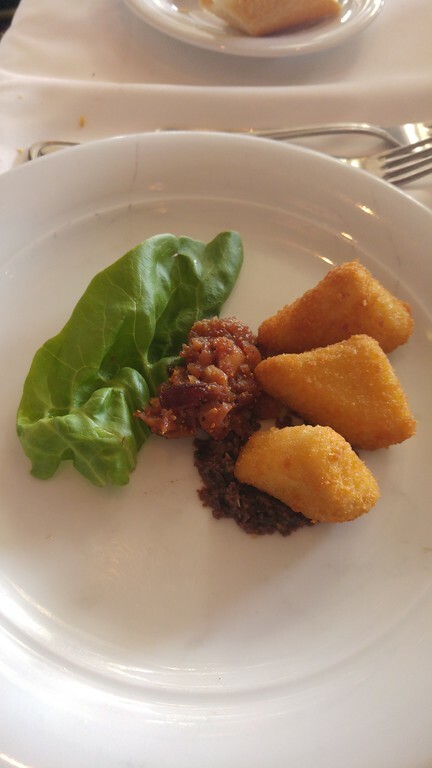 This was a lovely meal and we dressed smartly to suit the occasion – we tried a couple of appetisers as they looked fairly small but everything was well presented and delicious. We did look at buying a day’s internet package as we knew we had to check in online for our flight back from Hamburg the next day. 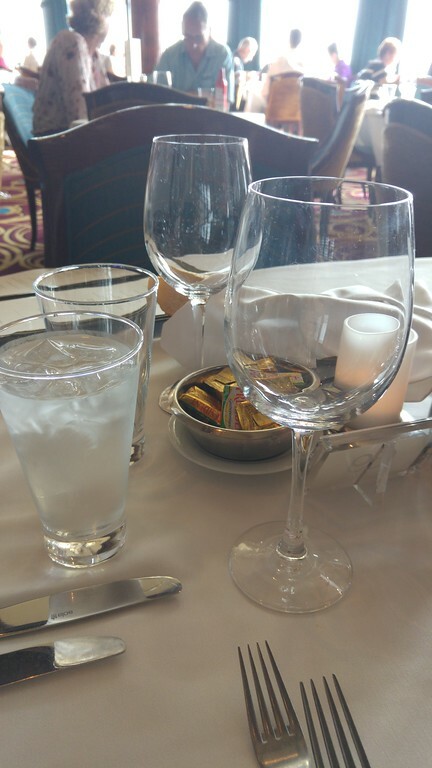 However, it was terribly expensive – much more than we normally pay on a cruise ship – so we decided to pay by the minute for checking in. We had also pre-purchased a shore excursion city tour combined with a transfer to the airport but were notified that morning by a phone message and note on our bed that this had been cancelled. We headed to the Shore Excursions desk (after waiting for it to open) and were informed that it was cancelled as only 5 people had booked it. We asked it there were any ship transfers to the airport and were directed to Guest Services who said yes, it costs $99 each but we had missed the deadline! So we headed back to Shore Excursions to ask for a Hamburg city map so we could get around by ourselves and they said they didn’t have one! Very poor service! In the end, I did a little research online while checking in and we caught a cab to the main Hamburg train station for 20 euros and got a train to the airport for 3.50 euros each. Disembarkation was quick and easy as we chose the walk-off option and many were staying onboard to continue onto the Baltic. Would we cruise Norwegian again? Not our first choice so only if the ship and itinerary were right. The food and entertainment options are great but the ship would have to be a lot more modern in design. You know what would be helpful was the cost of drinks (if you didn’t have a package) and price of internet. I appreciate the pictures of the room, not CEO to get an idea of the sizing. Great review!!! 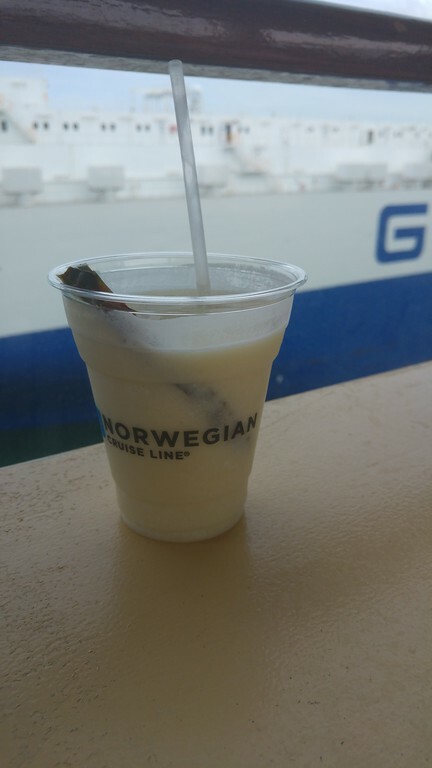 However, NCL now are now offering premium all-inclusive on a lot of new bookings so many of these drinks up to $15 will be included.